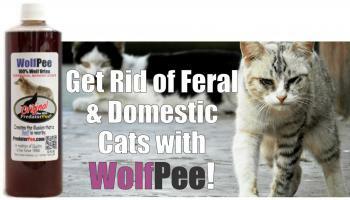 How to get rid of stray cats or keep feral and domestic cats out with PredatorPee® Wolf Urine – There is nothing more disgusting than finding that neighborhood cats have been using your prized garden for a litter box! 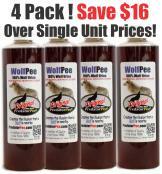 Now you can repel cats effectively and naturally with PredatorPee® Wolf Pee liquid or Yard Cover Shakin’ Flake Granules. A cat’s fear of a wolf is imprinted deep in their genetic code. When they smell wolf urine, it triggers the instinct to avoid or flee serious danger. Even if a cat has never seen a wolf in its life, the genetic life-and-death warning code of the wild is always on alert, which makes getting rid of cats easier than ever! 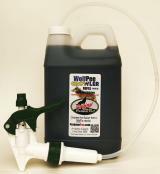 Keep stray cats away by creating a “pee-rimeter” around your flowers and vegetables using Wolf Pee Liquid in 12 oz or 16 oz bottles along with our ScentTags or 33Day All-Weather Dispensers. Or shake out our Shakin’ Flakes right on the ground around individual plants. When the cats smell the PredatorPee® Wolf Urine, they know that the rest room is closed! 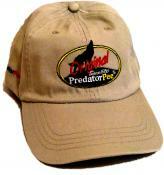 Getting rid of stray cats is easy with PredatorPee. Find your ideal wolf urine cat repellent below.